Canada's largest mental health and addiction teaching hospital has added a unique service for its aboriginal clients -- a sweat lodge to help promote spiritual, physical and emotional healing. 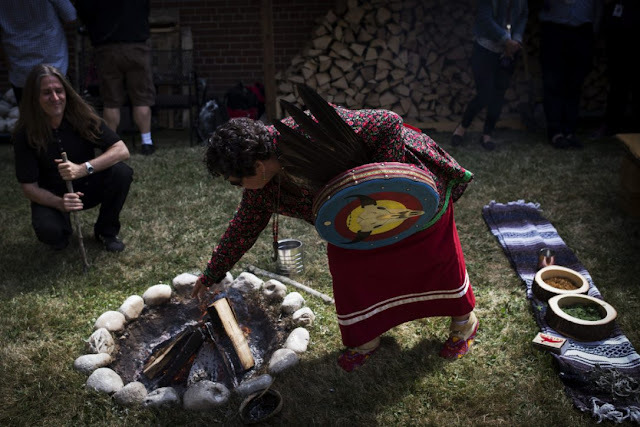 The Centre for Mental Health (CAMH) in Toronto unveiled the sweat lodge on a tucked-away section of its sprawling campus, fulfilling a goal set years ago to augment its services for indigenous clients by adding the ceremonial structure. 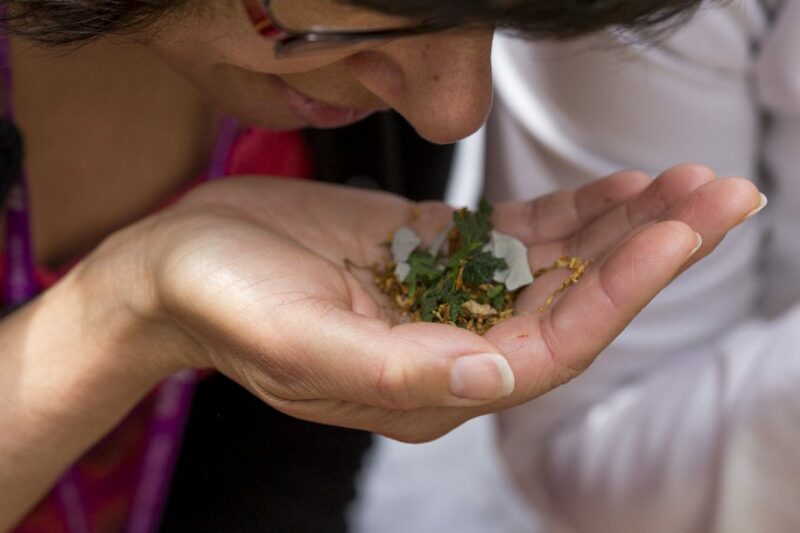 "Having the sweat lodge on-site at CAMH is going to allow us to offer indigenous healing ceremonies as part of the treatment plans," Renee Linklater, director of aboriginal engagement and outreach, said in an interview prior to Thursday's official opening. "This is going to be really important in our efforts to address what is appropriate aboriginal client care." The round sweat lodge -- 1.5 metres high and four metres in diameter -- is constructed from 35 maple and poplar sapling poles, gathered from the Six Nations of the Grand River community. Heavy tarp overlays the frame, with an opening facing a fire pit, where stones for the purification ceremony are heated. Inside, a second pit has been dug to receive those stones, which will be washed with traditional medicines and the "sacred water" that will turn into a cleansing steam. Participants sit encircling the pit inside the lodge and engage in prayer, songs and other rituals of healing with the help of a ceremonial "conductor." The process lasts about two hours. Diane Longboat, an elder with CAMH's aboriginal services, said clients with mental health and/or addiction issues go through a number of individual healing ceremonies before being considered ready for the rituals of the sweat lodge. Taking part in the cleansing ceremony is meant to cast out negative thoughts and feelings, and to help heal "the wounds in their lives," said Longboat, a Mohawk from the Six Nations of the Grand River territory in southwestern Ontario. The stones are called "grandmothers and grandfathers," terms reflective of aboriginal Canadians' great reverence for their ancestors. "When sacred water is placed on them and steam occurs, that's a release of the spirit inside those rocks we call the eggs of Mother Earth," explained Longboat. "Not only is it a physical detoxification of your body, but it's an emotional shift within you. "It allows me to cleanse myself, especially of those negative thoughts that keep coming back to me from time to time," said the 56-year-old. "So the sweat lodge ceremony allows me to release those. While the sweat lodge will initially be made available only to aboriginal clients, said Linklater, "we are certainly looking forward to a time when clients from other cultures can participate in our traditional healing processes." 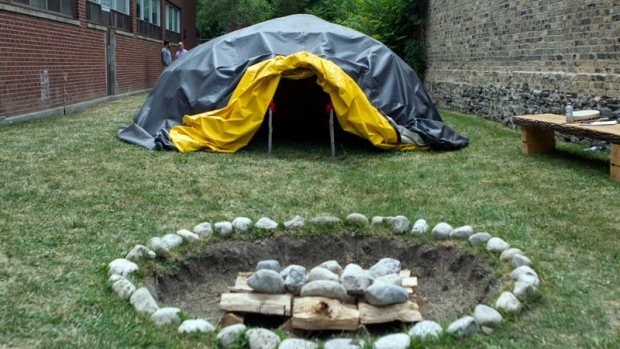 Responses to "Toronto hospital opens sweat lodge for aboriginal patients"
Wonderful initiative, many congratulations to all involved, and best wishes for deeply holistic healing, may spirit be a willing helper! Hmm wow This is great. Do they have a Aboriginal shaman there too ? I read about this web page some time a go -----> http://themindunleashed.org/2014/08/shaman-sees-mental-hospital.html I was thinking about my brother at the time. Wonderful! We are involved in a Detox residential program here in South Florida and will be building a sweat lodge on the premises soon..both my spouse and I are sweat lodge carriers and will be using this lodge to help detox patients in their purification process. We are blessed and look forward to helping people through their healing. Greetings and Blessing, Yes, Great idea in theory, yet as mentioned, the plastic covering is Not a good idea. The toxic nature of breathing in heated steam from a non-porus source, in this case, poisonous plastic covering, will cause additional health issues for all who enter it. The hospital should have access to a laundry facility to keep ceremonial blankets clean.